If the player draws a ship with the same name as a ship already in the harbor, he's spent too much time dilly-dallying and his turn ends (after using the ship to attack, if possible), with all the cards in the harbor being discarded. Otherwise, the player can stop whenever he likes, then use/acquire one card if three or fewer ships are in the harbor, two cards if four ships are present, and three cards if five ships are present. Players rob ships, collecting the number of coins shown on them, then discarding the card, while they hire people, paying the number of coins depicted. After the active player takes his 1-3 cards, each other player may pay the active player one coin in order to take one card in the same way. 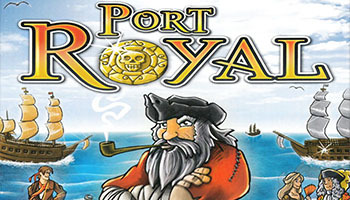 When one player has at least twelve influence points - which are on both people and expedition cards - the game is played to the end of the round, giving everyone the same number of turns, then the player with the most influence points wins. In the harbor of Port Royal life is bustling and you hope to make the deal of your life. But don't risk too much or your cargo holds will be empty. Don't forget to reinvest your profit to gain the favor of Governors and Admirals and to hire various other persons that can further your goals. Try to extend your influence and you might even be able to answer the call of one of the prestigious expeditions. The abilities of Persons are depicted on the top part of their card on the banner. The victory points you gain are depicted on the little shield to the right of the ability banner.